With the sweet 16 games set and ready to be played, how many people could have possibly predicted half the games lost and won? The biggest upset by far was the Northern Iowa and Kansas game. I myself picked Kansas to win overall as did 90+% of Americans. Apparently only 0.9% of people who filled out brackets at http://www.espn.com predicted that game—and I am sure we can all assume where they live. Twelfth-seeded Cornell became the highest seed to advance to the Sweet 16 this year as they knocked off Wisconsin, 87-69. It’s the first Sweet 16 appearance for the Big Red, and just the third ever for the Ivy League; the last team from the Ivy League to get this far was Penn in 1979. For all you Maryland fans out there, a real heart-breaker if you saw the game against Michigan State. With an 8-0 run in the final few minutes of the game, it looked as if the Terps might pull out the victory, especially after taking the lead by one point with 6-seconds to go with a shot by Grieves Vasquez. But Vasquez should have waited a second or two longer to make that basket. Anyone who missed the University of Maryland game against Georgia Tech on Saturday might still be kicking themselves; I know I am. At the end of a tight game, it almost seemed like Maryland would be handed their first home loss to another ACC team at Comcast Center. With 20 seconds left in the chess match-like game, Tech and MD stayed within 1-point of each other but MD had the lead at 73-72. But then Tech’s freshman Derrick Favors scored on a put-back layup with 3-seconds left in the game. It seemed as if the Terps would head into the locker room defeated. And then what can only be called a cruel joke left Terps fans in disbelief. Greivis Vasquez, the Terps captain and VIP player, took a shot–made it–but not before the whistle had blown as Maryland called a timeout before the ball left his hands. With .09 seconds to go, the shot did not count. After the refs put the clock back to 1.5 seconds, Eric Hayes in-bounded the ball to Cliff Tucker. 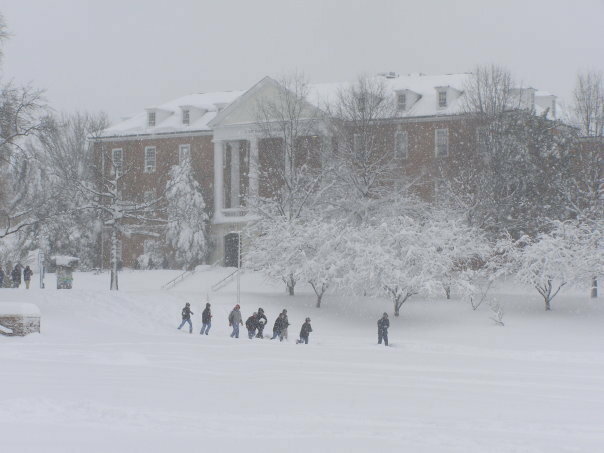 Everyone is stuck inside while the blizzard of 2010 rears its ugly head outside…and that includes the basketball players of the University of Maryland and Towson University. Towson University’s release on the game: the men’s basketball game between Towson University and UNC-Wilmington, which was scheduled for 7 p.m. tonight, was postponed. It is now rescheduled for 1 p.m. on Thursday, February 11 in the Towson Center. The game, scheduled to be carried on the Mid-Atlantic Sports Network (MASN) will not be televised. Admission is $5.00 for all tickets. The official release from the the University of Maryland, the Atlantic Coast Conference men’s basketball game between Maryland and Virginia scheduled at the Comcast Center for Wednesday, February 10 was postponed until Monday, Feb. 15 at 8 p.m. The game’s starting time and television broadcast information will be announced at a later time. All tickets for the originally scheduled game will be honored on Feb. 15. Some students at UMD say they would not have let the white-out keep them from cheering on their Terps, had the game not been postponed. Many of the students live near campus, or on campus, so feel like they would rather attempt to fight the storm and watch the Terp’s take on the Cavalier’s then be stuck in for another night inside. “Well, I live a 100 yards from the stadium so I would go, but it’s too far otherwise. The roads aren’t clear and we have been drinking in our buildings,” said Timothy Murphy, a senior Terp. “People have only been venturing out for food or beer, but they are getting stir crazy now so they might try to head over to the game if it was still being played tonight,” Murphy said. Even Coach Gary Williams remains dedicated to his team in this blizzard. Apparently, he slept at the Comcast Center because he didn’t want to risk getting stuck in the snow on the way to the game over the weekend. For many Towson University students, the game being postponed would not have affected them as much. For one, the Tigers do not have the same type of fan base that the Terps do; also, Towson is a bigger commuter school so many students live too far away to drive to the stadium. All school activities and classes in Maryland and Baltimore area have been canceled through Thursday, Feb. 11, so far due to the excessive amounts of snow that is at a record high, and Maryland being in a state of emergency. The University of Maryland Terrapins did not let the ‘white haze’ of snow blur their vision as they outscored last seasons national champions, the University of North Carolina TarHeels, on Sunday night 92-71. This was the worst loss in Carolina history under their head coach, Roy Williams. The reigning champions are long off their normal path that leads them to the final four–and Maryland is picking up their slack. The Terps (16-6, 6-2) have beaten the Tarheels (13-10, 2-6) four out of the last five matches; last season was a nailbiter as the Terps pulled ahead of the Heels to win 88-85 in overtime. Maryland head coach, Gary Williams, said he was nervous in the second half when the Heels cut what was once a 16-point lead to a 4-point lead with about 13 minutes to go. Williams had no reason to worry as his boys worked to get the lead back and that they did as they clobbered the Heels and sent them back to NC with another loss to add to their already high loss record. In other news, Maryland senior guard Greivis Vasquez was named the ACC Player of the Week for Feb. 8. It is the second time this season and the sixth time in his career he has been named Player of the Week. He was confident in winning Sunday. “Everybody was expecting us to win. That’s the way it should be,” Vasquez said after the game. Maryland being led by players like Vasquez will continue to be a consistent team that will be ranked as a favorite. Their moves now will only effect their journey to March Madness.